Why stop with end users when businesses and critical industries such as healthcare institutions, are major cash cows? Ransomware has proven to be an indiscriminate threat that targets organizations, from government agencies to small and medium-sized businesses (SMBs) alike. It has been so effective and pervasive that the FBI issued a warning on how an organization’s high-value data—like healthcare records—become most vulnerable to attacks. When attacked, cybercriminals don’t stop by just holding your information; they would want you to fork over a sizable ransom to regain access to your systems and files. Unfortunately, giving in to the extortion method only inspires further attacks—making this business model unlikely to disappear in the future. The healthcare industry, in particular, has been bearing the brunt of ransomware. The ransomware variant known as Locky, for instance, gained notoriety after it infiltrated the network of the Methodist Hospital in Henderson, Kentucky through emails containing a malicious attachment. The attackers forced the hospital to declare an “internal state of emergency” after every system and file was locked. The cybercriminals also demanded a ransom of US$1,600 for the hospital to regain access to their systems. Holding data hostage is one thing, but locking down a hospital is another story—as it places lives at risk. Unfortunately, this is only one of countless ransomware attacks that happen today, and the rate and severity of attacks are only projected to get worse. With new variants of ransomware surfacing, the risk of losing valuable assets rises as well. Organizations, especially those in the healthcare industry that handle critical data, can’t afford to lose access to those assets, forcing them to just give in to the demands of the attackers just to regain control of the affected data and systems. While attackers continue to find innovative ways to drive revenue to the cybercriminal enterprise, organizations should keep up by improving cybersecurity programs and measures. 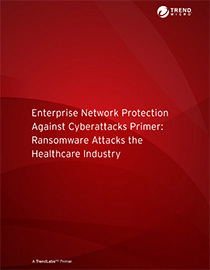 For more details on ransomware− how it leverages critical data to attack organizations’ security layers and how to stay protected against the threat, read the attached primer Enterprise Network Protection Against Cyber Attacks: Ransomware Attacks the Healthcare Industry.